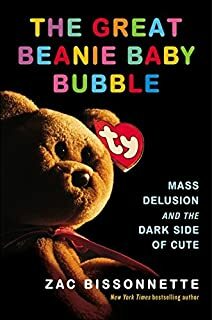 About a year ago, I read The Great Beanie Baby Bubble by Zac Bissonnette. It details how basic human greed, an artificial sense of scarcity and newly created technology like eBay, were used to artificially inflate re-sale prices and convince otherwise intelligent humans to sink their life savings into plush toys that were being created by the millions at a price-point measured in the pennies. In fact, it isn’t all that dissimilar to the current bubble in crypto-currencies—another asset class with; thin trading volume setting the market price and new technology that enraptures investors, that is likely to prove entirely worthless at some point in the not too distant future. It would seem that every time the Federal Reserve reduces interest rates for too long in order to bail out some past bubble they created, it leads to some new and bigger bubble that also needs bailing out (tech stocks in 2000, real estate in 2007, everything this cycle) along with some hilariously silly collateral bubbles along the way. With that in mind, last week, I was at a flea market (yeah, I’m a value guy who likes bargains) when I noticed multiple tables with Beanie Babies. I thought to myself; that’s strange—I haven’t seen one of these things in years. Why are all these adults paying so much attention to stuffed toys that were popular 20 years ago? Naturally, I turned to my wife, who happened to be buying a few Beanie Babies for some cousin of ours. Me: Why are you wasting money on those? Wait, …did you just buy like 10 of them? Wife: Yeah, our cousin collects them. He says he has one that’s gone up 5 times in value, in just the past 3 months? Vendor: Yeah. They’ve been out of print for two decades, even some of the real common ones are quite rare now. Vendor: Yeah, a few have gone from $5 to over $1500 in just the past 2 years. Wife: Maybe I should buy some more for our cousin. Sounds like they’re going up fast.